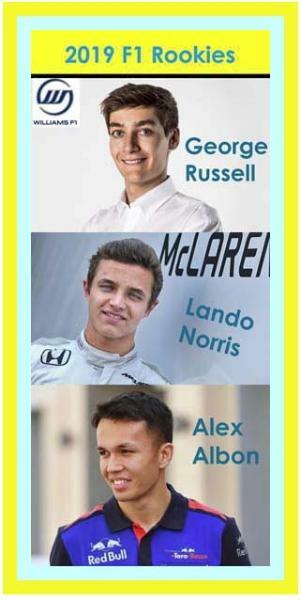 Lando Norris - 19 y/o Brit finished 2nd in 2018 F2. Racing for McLaren. George Russell - 20 y/o Brit won 2018 F2. Racing for Williams. Alexander Albon - 22 y/o Thai-Brit finished 3rd in 2018 F2. Racing for Toro Rosso. Robert Kubica - 34 y/o Pole raced F1 for Sauber 2006-2010. Racing for Williams. Danill Kvyat - 24 y/o Russian raced for Toro Rosso 2014-2017. Racing for Toro Rosso. Fernando Alonso - Has quit F1. Will compete in 2019 Indy 500 & 24 Hours of Daytona. Marcus Erisson - Out at Sauber. Joining IndyCar series. Brendon Hartley - Out at Toro Rosso. Carlos Sainz Jr - Out at Renault. Moved to McLaren. Charles Leclerc - Quit Sauber to joing Ferrari. Kimi Raikkonen - Out at Fererari. Moved to Sauber. Daniel Ricciardo - Quit Red Bull to join Renault. Pierre Gasly - Quit Toro Rosso to join Red Bull.